A question most of us deal with as hosts is, what to serve as an appetizer? While there are a number of usual recipes in our mind, when trying to think of something new, we often get stuck. 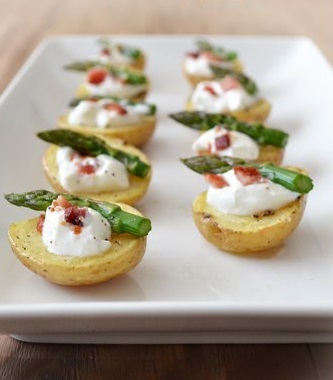 Well, here’s a dish to break the boredom – Baked Potato Bites. These delicious bites make for the perfect filing appetizers before any meal, formal or otherwise. And they’re super easy to make. Try them as soon as you can. You’ll love them as much as we do! Note: If asparagus is unavailable, you may use any other crunchy green such as green beans. Set your oven to preheat at 450 degrees F.
Wash the potatoes thoroughly and pat them dry. Without peeling them, cut them lengthwise in half. Lightly grease a baking dish and put the sliced potatoes in it. Combine the olive oil, salt and pepper and toss the sliced potatoes with this mix. Roast the potatoes for about 15 minutes or until they become tender. When done, remove the dish from the oven and let the potatoes cool down. Remove the potatoes from the baking dish and add the asparagus to it. Toss the asparagus with any remaining olive oil and season it with salt and pepper too. Roast in the oven until done as desired (4 – 5 minutes should work). Remove from oven and allow them to cool. Then cut each roasted asparagus into 3 parts. Arrange the baked sliced potatoes on a serving plate. Top with 1/4 teaspoon sour cream, one roasted asparagus part, and 1 – 2 pomegranate seeds. Serve!